Health sharing plans are a completely different way to address health care costs. In the past two years, the number of Americans that have gone this direction tops 2 Million. That number will only grow with each round of rate increases for the ACA plans. Keep in mind that health sharing plans are NOT health insurance. Most importantly, how are they different from health insurance. Many people are looking at health sharing plans because the rates are usually half of un-subsidized health insurance plans. The benefits may look similar but health sharing plans are a different way to address to health care expenses than health insurance. First, where did they come from? Health sharing ministries as they are called have been around for a while. Trinity Healthshare provides the more catastrophic coverage for AlieraCare. The ACA law is what really caused them to grow from a small piece of the market to an exploding phenomenon now. It has more to do with the ACA effects on health insurance for a part of the population. There's really a divide now with ACA plans (Obamacare). The real thrust of the ACA law is the tax credit. It's based on income and if you qualify, it can really knock down the cost of coverage. We have people whose premium is $1/month (the lowest by law). We see $1000's of tax credit per year on average depending on age and area. They came out okay with the law. What about the Have Not's? If you don't qualify for a tax credit (primarily based on income), it's not so pretty. The individual/family rates have roughly doubled or tripled since 2014. With each year's open enrollment we're seeing double digit increases. We're not surprised...it was all baked right into the law! That doesn't make it easier to handle. The stick is the tax penalty! If you don't get coverage, you could be looking at a tax penalty up to 2.5% of income. Let's be clear...there were lots of changes with the ACA law on the eligibility and benefit side that were extremely beneficial. Everything from guaranteed issue (can't be declined due to health) to mental health and Essential health benefit standardization. This has been a huge benefit for many people. If you have a tax credit, you don't see that cost. If you don't...well...that's a different story. The problem is that we're seeing premiums now on the Bronze plan at $800-$1000 for older individuals. If you make $50K (over the tax credit limit), that's 25% of your gross income! That's the response we get from those people. I don't want to go uninsured and I don't want to pay the penalty. That should frame up why health sharing plans exploded onto the scene. Let's look at this piece! For the segment of the population left behind by the ACA law essentially, health sharing plans attracted lots of attention. Deep in the ACA law (remember...it's 1000's of pages) was a carve out for "health sharing ministries". It was a concession to social conservatives essentially for religious based objectors. For example, if you're forcing all health insurance to cover birth control and abortion, these senators won't vote for it unless you give religious people way to avoid this mandate. This narrows the list significantly since we only want to consider companies that meet the strictest requirements for this type of coverage. Most people think of these entities as Christian based health coverage. That's true for some but not all. AlieraCare is our favorite because it's the most flexible. They just have a statement of beliefs and they are the most inclusive. This fits us better and it's fits the U.S. better. Health sharing plans are NOT health insurance. Let's look at how they work and then we'll dive into the comparison with health insurance. Health sharing plans are essentially memberships. Members agree to pay a month amount and share health care expenses with other members. 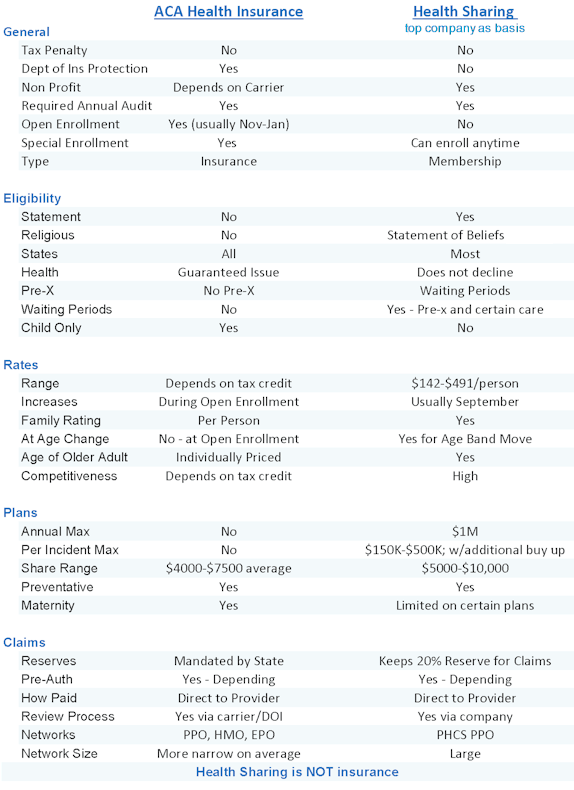 In some ways, health insurance is the same way but there are very big differences (we'll get to in the comparison section below). Health sharing plans are not allowed to use health insurance terminology. Membership Dues - Health sharing plans do not have Premiums. Eligible Expenses - Health sharing plans do not have claims since that term denotes a responsibility of a 3rd party to pay. Health sharing companies hold membership dues in an escrow account and pays for eligible expenses. 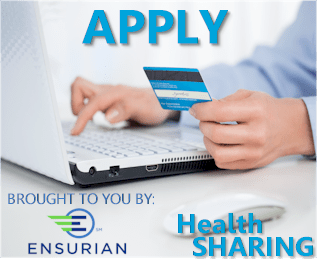 Practically, what is the difference between health sharing and health insurance? Here are the big differences that are important to understand. 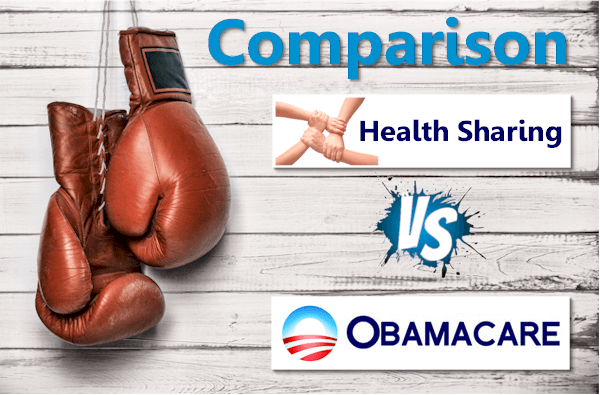 Let's look at each of these comparisons separately for health insurance versus health sharing. We'll use AlieraCare as our health sharing company since they're the strongest and most flexible. There are some important considerations here. Part of being insurance is that there is a Department of Insurance which regulates the companies and market. They also provide a backstop in case a carrier goes bankrupt or doesn't pay claims. Health sharing plans do not have this backstop. They also don't have the requirements that go along with health insurance. Some of these requirements are important but they have also exploded the cost of health insurance, especially with ACA law. Another piece of the DOI protection is that health insurance carriers must keep a certain level of reserves in case of big claims. Health sharing plans are not required to. That being said, AlieraCare keeps 20% of premium for reserves which is one of the reasons they are our favorite health sharing plan by far. Health insurance plans are guaranteed issue and do not have waiting period for pre-existing conditions. Health sharing plans have requirements in terms of beliefs. AlieraCare is the most flexible with just a Statement of Beliefs. They also have waiting periods for pre-existing conditions and waiting periods until certain specified benefits are paid out. For this reason...if you have ongoing health issues, health sharing plans might not be the best approach. We're happy to walk through this with you as we can deal with either health insurance or health sharing options. For health insurance plans, you can only enroll during open enrollment or if you have a special enrollment trigger (usually marriage, birth, loss of coverage, or move). You can enroll anytime during the year for AlieraCare health sharing. We get countless calls after January where people are trying to avoid the tax penalty. Health sharing plans might be the only option here. This is why many people are considering health sharing plans to begin with. If you are eligible for a tax credit through Obamacare, that's probably going to be the better way to go. Depending on how much tax credit! 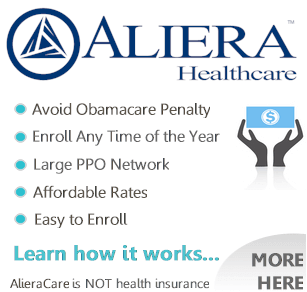 You can run your ACA quote here with tax credits and here with AlieraCare health sharing. With those two pieces, we can compare. If you have more complicated income situations, please call us at 800-320-6269 or email with questions. We want to get this right! There's no cost for our assistance! If you don't qualify for a tax credit, the AlieraCare health sharing plans can be much less expensive than the Bronze ACA plan. That's a huge deal especially if you're in your 50's or 60's and it amounts to $1000's/year in savings. As we mentioned above, health sharing is probably not a good fit if you have ongoing health issues or pre-existing conditions. A few further notes on rates. You'll notice on the health sharing quote page, that the rating is pretty simple. No area effect on rates. Each person isn't individual rated as with health insurance. We still have the "family rate" with health sharing plans. The rate is based on the age of the older adult. For health insurance plans, rate increases generally occur at open enrollment time (end of year). Rate increases due to changes in age also occur during open enrollment. For AlieraCare health sharing plan, rate increases generally occur in September. Rate changes due to age (the older spouse) will occur at time of birthday. We have some big differences here. After the ACA law (Obamacare), health insurance plans are mandated to cover the 10 Essential health benefits. Very specific requirements on what is covered. Health sharing plans do not have this requirement. For example, health sharing plans will not cover mental health. RX is also handled with an RX discount card as opposed to defined benefits. We're happy to walk through your situation. Ultimately, you have to compare the monthly savings against paying more of this out of pocket when comparing the two. You can access the Member's Guide for more information on what is covered and how it's treated. This is true even for State specific information like Covered California versus health sharing. After the ACA law, health insurance does not have a lifetime or per-incident max. AlieraCare has $1M lifetime max benefits and different per-incident maxes depending on plan choice. We like the AlieraCare Premium due to its $500K per-incident max. Remember that we're getting coverage for the big bills anyway. Keep in mind that we can change to the ACA plans during open enrollment (end of year) and if we have big life changes (marriage, birth, move, loss of eligible coverage). If Maternity is even out there in the ether, health insurance plans are probably the best fit. We can mix and match with mom on an ACA plan and dad on a health sharing plan. The AlieraCare premium has a built in maternity benefit but it's capped and maternity can be very expensive these days. This is one of the reasons we like AlieraCare the most of the health sharing plans. They use a bonafide PPO network (PCHS search here). PCHS has over 1 Million providers across the US. 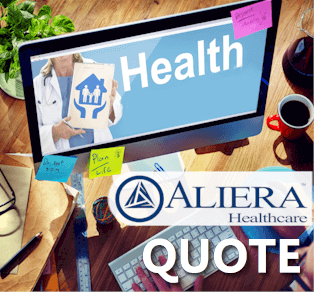 Unlike some of the other health sharing companies, AlieraCare reimburses the doctor/hospital directly. This is much more familiar to members as well as providers. If you can't show a card to the hospital, they may treat you differently. That's just the way our current system is now. What about networks for health insurance companies? In general, there's been a shrinking of networks since 2014 both in terms of size and in terms of type. By type, we mean PPO, EPO, HMO. There's been a steady slide from PPO type plans (most flexible) to EPO (less flexible) to HMO (least flexible). On top of this, we've seen networks shrink by about 1/3rd from pre-ACA plans. This has probably been the biggest issue with the Obamacare rollout for people. This is actually a huge advantage for AlieraCare health sharing. Some of the other health sharing companies have confusing setups where members reimburse other members directly and the person has to pay up front with the doctor or hospital. 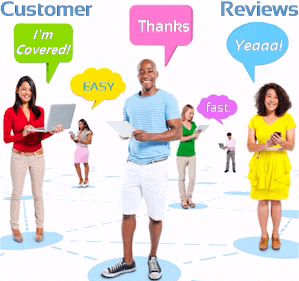 We don't like these setups and for that reason alone, we favor AlieraCare for health sharing. You can check the AlieraCare Provider search here. You can check the ACA (Obamacare) Provider search through the quote here (a link is available under any given plan). There are some similarities and some big differences in terms of reimbursing medical expenses between health sharing and health insurance. First, keep in mind that "Claims" is an insurance term. Health sharing doesn't have claims. They call it eligible expenses or sharing expenses. Health insurance carriers are heavily regulated in terms of coming through on claims. An insured person always has the DOI (Department of Insurance) to take disputes to. The DOI also backstops the member in case the company goes bankrupt. Health sharing companies do not have this protection since they are not health insurance. This means we need to look at the most solid of the 6 ACA recognized companies. That's AlieraCare in our opinion. AlieraCare is one of the fastest growing of the 6. We really think they are the company that will dominate this market. We also think this market will dominate a part of the health payment market. Let's look into our crystal ball. We have been helping people navigate the health care market for over 25 years. 1000's and 1000's of clients. There has never been a time when the market is such jeopardy as right now. There is no telling what will happen over the next 5 - 10 years. Nothing coming out of Washington will address the core cost issues of the market. The ACA law sped it up. The new Trumpcare iniatives will continue this path in a different way. I wouldn't be surprised if we end up with single payer only because the market falls apart. What does health sharing have to do with this? You're going to see a lot of healthy people move to this option. Health people with no tax credit will start to move this direction because they can't afford the annual rate increases for ACA health insurance. With every healthy person that leaves the ACA marketplace and moves to health sharing like AlieraCare, the ACA market gets weaker. As a result, rates go up faster. Which means more healthy people leave. And the rates go up even faster. We've seen it many times before in our 25+ years. We don't know if health sharing will be the end game but it's definitely going to become a force over the next 5-10 years until the dust settles. We're happy to help you understand this new option at 800-320-6269 or by email. The main draw is the pricing and the lack of tax penalty. The main concerns for people new to health sharing are the lack of protection that insurance is required to have and waiting periods for certain coverages. Make sure to review the Member's Guide here. Not because it's any better for us. We're contracted with the major health sharing companies. In our view, there's really only one option we feel comfortable with. It's Aliercare by a far margin. Keep in mind our background. We've been health insurance agents for over 25+ years. We've received calls from people who have had bad situations from bogus companies out of Texas that would pressure sell people terrible policies. You can hit $50-100K in one night at a hospital. I've called the DOI on those companies and they never could do anything because they were domiciled outside of California. As more of our clients are considering dropping coverage altogether due to the double digit rate increases, we are very cautious about new ways of covering health care costs. We have 1000's of clients. Some dating back to 1995. We are also a top 100 agent for Covered California. We can help people in many states with AlieraCare including compare Covered California versus health sharing. We investigated the health sharing landscape and there is only one company we're willing to get behind. These are some of the highlights but we feel the most confident that AlieraCare becomes the face of the health sharing market. Here's a comprehensive guide to comparing the main health share ministries. It's going to be a face you hear quite a bit about in the next few years. Health sharing plans are an entirely different breed in terms of paying for health care costs. Make sure to see the acknowledgement we provide to new enrollees to make sure they really understand what they are buying. It's important to us that you are empowered! Health sharing is new to many people but it won't be that way for long. The ACA rates are going to continue to spiral if you don't get a tax credit. Many people can't afford not to go this route.